We humans forbade it a long time ago, but there’s one insect that uses chemical warfare of the sort we banned in the Geneva Conventions. Researchers used intense X-rays at the Advanced Photon Source to study how the bombardier beetle sprays hot, caustic chemicals from two rear glands when threatened. Image by Andrew WW via Creative Commons. That’s the bombardier beetle, which creates a noxious, boiling hot stream of chemicals inside its body to spray at enemies when threatened. 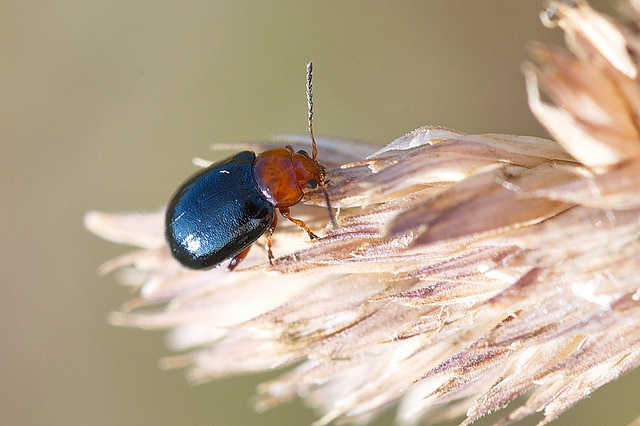 Researchers using the Advanced Photon Source, a U.S. Department of Energy user facility at Argonne National Laboratory, have gotten the first-ever look inside the living beetle as it sprays. The results are published today in Science. Scientists and engineers have long been interested in the beetles’ rapid-pulse firing—more than 600 times per second—with the intent of stealing the technology: it’s been studied for everything from ways to design jet engines that re-start in midair to a deterrent to ATM vandals. “We were not only able to see how the gas and vapor react inside the beetle, but also quantify the reactions that happen,” he said. “Synchotron X-rays allowed us to visualize the dynamics of explosions as they occurred within the reaction chambers inside of the beetle’s bodies. Using this sophisticated, powerful technology, we could finally test previously untestable hypotheses generated by studying the anatomy of dead specimens,” said University of Arizona entomologist Wendy Moore, who specializes on bombardier beetles and co-authored the study. Top: The bombardier beetle can aim its noxious spray from two separate rear glands. Bottom: This colored scanning electron microscope image shows the structure of the two glands. To protect the beetle’s insides, the chambers holding the chemicals are lined with a thick layer of protective cuticle, shown in brown. Areas with less cuticle—and more flexibility—are shown in blue. The white arrow identifies the reaction chamber; the purple arrow shows the junction between the reaction chamber and the exit channel; and the yellow arrow points out the exit channel dorsal membrane. The beetles store the chemicals in two separate compartments inside their bodies: a reservoir holding most of the chemicals and an armored chamber that contains enzymes to jump-start the reaction. When they’re ready to fire, a valve between the two compartments opens and the chemicals react to form a boiling, high-pressure cloud that is ejected with a bang. “What’s interesting,” Lee said, ​“is that it appears the reaction creates such high pressure that it pushes the valve closed automatically, which readies it for the next pulse. This means the beetle doesn’t need a high-speed muscle to repeatedly open and close the valve, and only has to expend energy to open it.” At 600 times per second, that’s a lot of energy saved. This new understanding of how the glands produce—and survive—repetitive explosions could provide new design principles for technologies relating to blast mitigation and propulsion, the authors said. The paper, ​“Mechanistic Origins of Bombardier Beetle (Brachinini) Explosion-Induced Defensive Spray Pulsation,” was published in Science on May 1. The study was supported by the U.S. Army Research Laboratory and the U.S. Army Research Office through the MIT Institute of Soldier Nanotechnologies; by the National Science Foundation; by the U.S. Department of Defense; and by the U.S. Department of Energy’s Office of Science. The Advanced Photon Source is a DOE Office of Science User Facility. Other study authors were MIT’s Christine Ortiz and Eric Arndt and the University of Arizona’s Wendy Moore. Argonne National Laboratory seeks solutions to pressing national problems in science and technology. The nation’s first national laboratory, Argonne conducts leading-edge basic and applied scientific research in virtually every scientific discipline. Argonne researchers work closely with researchers from hundreds of companies, universities, and federal, state and municipal agencies to help them solve their specific problems, advance America’s scientific leadership and prepare the nation for a better future. With employees from more than 60 nations, Argonne is managed by UChicago Argonne, LLC for the U.S. Department of Energy’s Office of Science. For more, visit www​.anl​.gov. DOE’s Office of Science is the single largest supporter of basic research in the physical sciences in the United States, and is working to address some of the most pressing challenges of our time. For more information, please visit sci​ence​.ener​gy​.gov.